И из дыма вышла саранча на землю..
Entomologist Lynn Kimsey discovered a new species of wasp on the Indonesian island of Sulawesi. The very large wasp — 2.5 inches long — has extra large jaws that are longer than its legs. 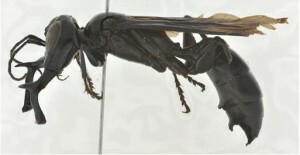 The huge wasp eats other insects.